↑ Al Qaeda-linked group strengthens hold in northern Syria, CNN (6 November 2013). Дата обращения 3 декабря 2013. ↑ Backed By Russian Jets, Syrian Army Closes In On Aleppo, Reuters (4 February 2016). Дата обращения 5 февраля 2016. 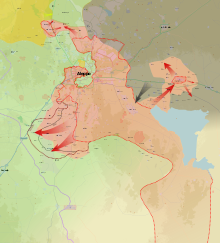 ↑ Syrian government forces in north choke opposition supply lines (5 February 2016). Дата обращения 5 февраля 2016. ↑ bigmir)net. [/world/1041733-Siriiskaya-armiya-zahvatila-strategicheskii-kvartal-v-Aleppo---SMI Сирийская армия захватила стратегический квартал в Алеппо - СМИ]. Дата обращения 28 ноября 2016. ↑ Laub, Karin. Aleppo confronts vast destruction left by 4 years of war, Washington Post (23 December 2016). Дата обращения 29 декабря 2016. ↑ Saad, Hwaida. Storied Syrian Mosque’s Minaret Is Destroyed (24 April 2013). Дата обращения 24 апреля 2013. ↑ Spencer, Richard. Syria: 11th-century minaret of Great Umayyad Mosque of Aleppo destroyed, The Daily Telegraph (24 April 2013). Дата обращения 25 апреля 2013.